Subscribe for the after-intro clinics here! Ultimate frisbee is een epische sport, vooral bekend bij studenten. Vertigo is de ultimate frisbee vereniging van de TU/e. Vertigo draait mee met de landelijke competitie, (internationale) toernooien en we hebben ook spelers die uitkomen voor Nederland bij het EK. 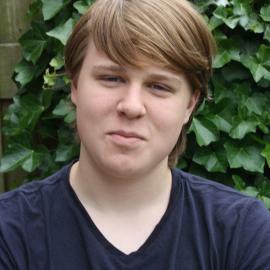 Wat je sowieso een keer moet meemaken zijn de toernooien (en de bijbehorende beruchte feesten). Subscribe/schrijf je hier in voor de after-intro-clinic. You won’t regret it! After a two years break, our friends from Wuppertal finally decided to dust-off their Katzenjammer-tourney concept. Naturally, we gathered a team (special thanks to our pick-ups Linda, Laurens and Tom), and hit the road :). As no theme was officially announced we decided to go with crappy car and yellow hat. 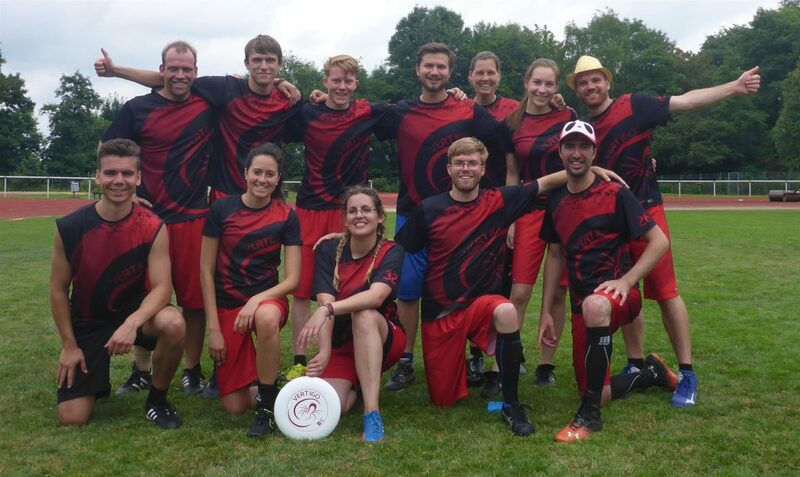 After arriving (without being pulled over 🙂 ) and some debate on why a club in Wuppertal would be called Caracal, we could finally start playing and show what ultimate is all about! Unfortunately, it became clear that we were not able to defend our podium-position, but luckily, only the beer-race matters in Germany right? After selecting our most fearsome woman and man the slaughterhouse began. Everyone knows what happens in Wuppertal stays in Wuppertal; I will only report that for some of us digging and licking was involved. 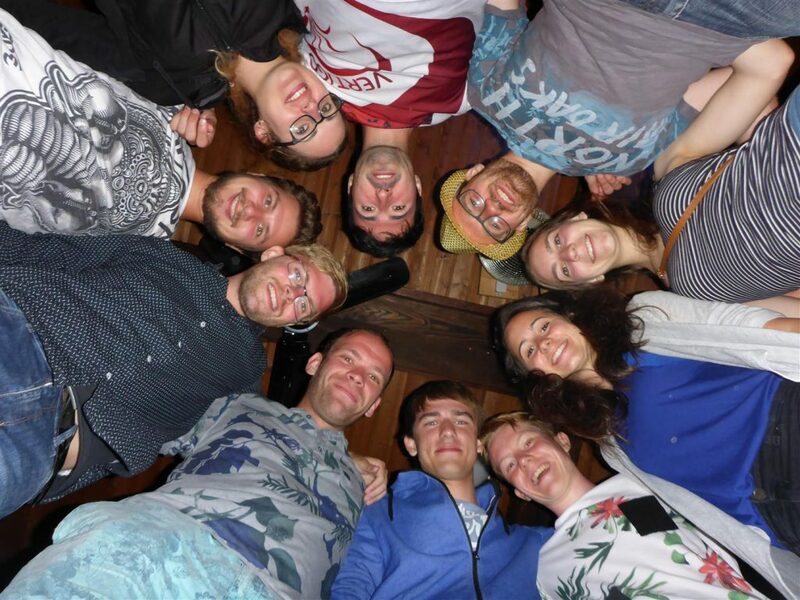 With a preparation of wienerschnitzel, pizza and German beers we were ready to hit the party! Clearly, some party-skills had to be introduced to our eastern neighbors. Being as educational as we are, we got the party started and partied till early hours. The next morning, coffee and a good breakfast were waiting for us, a nice second tourney-day with some ultimate and some shots and some more shots :). We ended the weekend with some Swedish meatballs back in Eindhoven. Since last year Vertigo also has a youth team, they just promoted to the first division of the U20 (Under 20 years old) national league. Proud to have them there :). Register by mail. More info here. It can’t have escaped anyone’s attention in the Ultimate scene, the European Ultimate Championships (EUC) are happening! 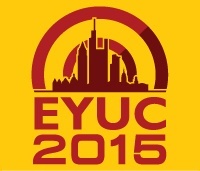 Okay, it’s not entirely true; the Regular EUC 2015 is over (July 25TH – August 2ND) and the detailed results can be found here. 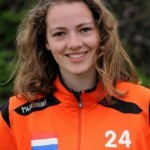 Dutch Women team got 11th (of 19) + 1st Spirit!!! However!, the European YOUTH Ultimate Championships (EYUC) have just begun, and that’s where it becomes interesting, as three(!!) Vertigo players are participating! Here is the games schedule, and here are the results of the played games. We proudly present to you our members playing on three different teams, along with links and the schedule for their games. 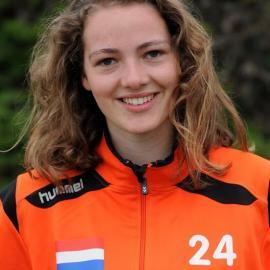 Last weekend (June 5-7), was again the annual GNSK (Grote Nederlandse Studenten Kampioenschappen). A great sports event that is hosted by another (student)city every year. Last year it was hosted by Tilburg, this year by Amsterdam and next year it will be hosted by Groningen. 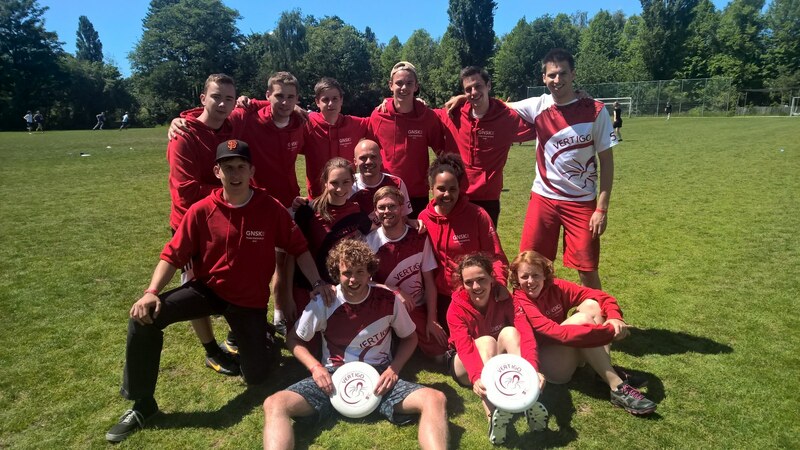 Because Ultimate Frisbee was one of the elected sports this year, we could send a team as well, so Vertigo (or in this case Team Eindhoven) had a team of fourteen underway. On Friday, we all gathered around 6 p.m. at the Eindhoven train station, from where we would go to Science Park Amsterdam. After the lovely pear popsicles (thanks Emile) for the hot weather, we were on our way! Though the weather was nice, (thunder)storms were forecasted as well. However, we were in the train when the rain passed, and when we arrived in Amsterdam, the storm was reduced to a little drizzle. Good weather to put up dry tents, which turned out to be a bit of a chaos, since the organization had too little space reserved for each city. Solution: find an open space and blend in with other cities. After the tents were pitched, the mattresses filled with air, the sleeping bags rolled out and the red sweaters divided (which were different from last two years), it was time to find out where the party was going. The party turned out to be literally around the corner, since the organization put up a circus tent on an adjacent field. With the entire team present, the first beers were ordered, which happened to be half price (also thanks to Emile’s barter skills I believe), so no lack of beer in the beginning. After some hours of partying (where some Belgians were eager to show their dance-moves), the first day was done and everyone went to bed. The second game of the day was against NUTS (team Amsterdam). Although we thought we would stand a better chance against them, we were able to keep up a little while. During the game it turned out that they were clearly the better team, and we had to conclude the game with another loss, so congrats NUTS. The third and last game of the day was against UTKA (team Utrecht). Since both teams had two games already, they appeared to be longing for a good shower and a cold bear. Although the game went well in the beginning for Vertigo, UTKA turned out to be the superior team, and I think the final score (3-9 for UTKA) tells enough. Congratulations UTKA for this great game. After the last game, we went back quickly to the camping site to get in the shower and prep ourselves for the party. 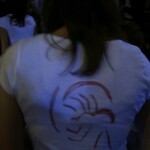 This party was planned to be in the Amsterdam Studios, a location away from the camping site, where we were taken by bus. The bus trip turned out to be an adventure of its own, since the driver seemed to be happy to show off his driving skills to the students in his bus. Fortunately we made it to the studios in one piece. Arrived at the studios, the first activity was to watch the Champions League final. This couldn’t be over soon enough, since we were not here for soccer, but for partying! As I mentioned before, we arrived in one piece… the PA-system however, did not. This conclusion was drawn when the DJ told everyone he had some issues with his sound. Thankfully, his MC managed to keep everything together (and yes, this is sarcastic). After a while, a second area opened up, where three other DJ’s started to play their music. Unfortunately, they were not granted the power of large subwoofers, so the result was not what it could have been. In different busses, and on different times everyone went back home. Some players of Vertigo decided they had to be the last ones leaving the party, so they were back at the camping at about 4 am. The Sunday came early enough, since the first game was early on the schedule. At 9.50 we were expected at the sports field. Arriving at the sports field (in groups off course), some decided to take a restroom break and others to get a tan before the game. Our opponent WAF (or team Wageningen) was already busy with warming up by then. This turned out to be a golden tactic for us, because after our victory on Wageningen, they told us they believed it would be an easy win for them. For us, it seems to become Vertigo’s tournament trademark to close the party on Saturday and win the first match on Sunday. Thanks Wageningen for the great game! The second match, which started after a three hour break, was against Groningen. Although Groningen was battling Wageningen in last year’s GNSK, they had some troubles forming a team. It turned out they had to bring some unexperienced players, whose first tournament this was. It turned out to be a great game after all, with another win for Vertigo and a good feeling for everyone. Thanks Groningen for this great game! 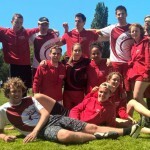 The last game of the tournament was planned against the BFrisBee2’s (team Nijmegen). Since this was the sixth game in two days, some players started to feel the fatigue from two days of playing. Despite the muscle aches, we lifted our spirits one more time (again not by warming up together, like Nijmegen) to face our opponent. Although we played and defeated Nijmegen before in competition days, we had to let the victory to them, so our streak of wins ended there. Nevertheless it was still a fantastic game. Thanks to Nijmegen and congratulations with the win. 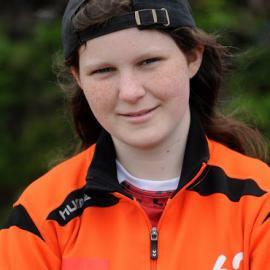 The two wins on Sunday resulted in a 5th place overall for Vertigo, so not a bad result after all! After the final game, we quickly went back to the camping to clear the field of our tents, get showers and travel back to Eindhoven. Because we had 19 minutes of transfer time at Amsterdam Central Station, everyone had time to get diner, so the coupe turned out to be a picnic zone when we left Amsterdam. Arrived in Eindhoven, everyone went in their own directions to drop on the couch, get a cup of coffee, or simply go to bed. Thanks to everyone who went to GNSK for the fantastic weekend, thanks to the opponents for their effort to make us tired and the good spirits during the game! Hopefully until next year.